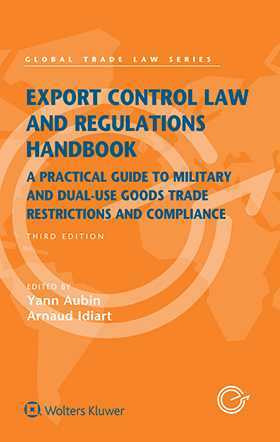 Export Control Law and Regulations Handbook provides a practical overview of the export/import control regimes covering defence and dual-use goods and services in fourteen key jurisdictions in addition to chapters on the international regime in general. The importance of export control laws and regulations in international trade continues to grow, not only because of the increase in world trade and technology dispersion but also due to concerns surrounding national and regional stability and the risk of terrorism. Accordingly, familiarity with export control laws and regulations around the world has become extremely important for those involved in the international trade of dual-use or military goods, technology, and services. In this pre-eminent Handbook, now in its third edition, two experienced professionals have gathered contributions from expert practitioners and academics. This third edition adds three new country chapters (Brazil, Israel, and Sweden) and a new separate chapter on sanctions and embargoes. The structure of the Handbook is identical for all country chapters allowing the readers to quickly find the same information always in the same place regardless of which country chapter they are consulting. In addition, with the Handbook, a variety of practical documents (such as standard licences, permits, authorization, letters, processes) are made available to the readers online. The Handbook remains one of the best-selling works in the trade law portfolio. It provides in-depth, and easy to access information about the main questions that exporters or importers of controlled dual or military goods, technology, or services are confronted with on a day-to-day basis. The Handbook is invaluable to any professional (such as lawyers, compliance key players, procurement, logistics, finance, and customs practitioners) working in relation to an organization with a need to know the specific requirements to be followed for the efficient – and legally compliant – import or export of controlled military or dual-use goods, technologies, or services. The Handbook offers readers access to both substantial and practical information about a very complex and fast moving area of the law as well as an international network of practitioners and professionals that the editors have gathered.